Over the past decade, the city of Rajkot has experienced a rapid rate of urbanization along with the consequent rise in vehicular and industrial emissions. To counteract this alarming situation and take actions to clean up city’s air, Rajkot Municipal Corporation (RMC) planned to install environmental sensors across the city initiated through "Eye-Way" project. The "Eye-Way" project by RMC was initiated to enhance the safety and security, to improve the efficiency of municipal services and promote a better quality of life for citizens; with the vision to modernize into one of the smartest cities in the country. All the sensors had to support multiple connectivity options such as Ethernet, Wi-Fi and GPRS communication options for the field deployment as fiber network or Wi-Fi was not yet availed throughout the city. The solution had to integrate multiple protocols in order to support real-time automatic information shared at various locations like command and control center, digital boards, Public portals, mobile applications and also needed to have provisions for sharing the data with other govt. departments in future. 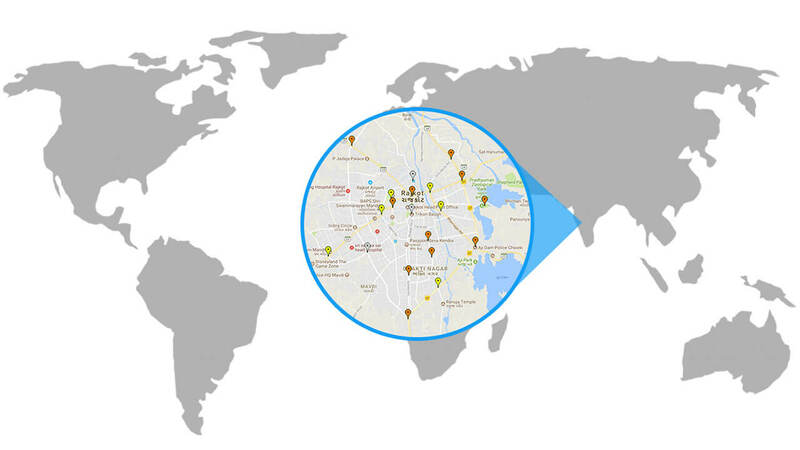 A central software was required which needed to fulfil various requirements for raw data visualization with geotagging, AQI calculation in real-time, statutory reporting, device management and configuration of all the sensors deployed across the city. An alert system had to be designed which would warn officials and citizens about extreme weather conditions to take necessary precautions and easy decision making. Honeywell India was awarded the order to execute the complete "Eye-way" project who collaborated with Phoenix Robotix to deploy a complete environmental sensor network across Rajkot smart city. These network of sensors measure different parameters related to air quality such as Oxides of Nitrogen (NOx), Sulphur Dioxide (SO2), Carbon Dioxide (CO2), Carbon Monoxide (CO), Oxygen (O2), Particulates, Temperature, Humidity, Ambient Light, Noise etc. 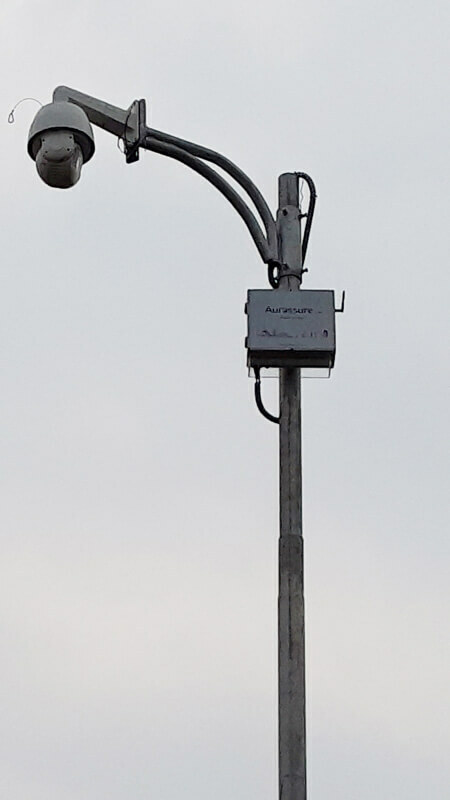 On 21st September 2017, the "Eye-Way" project was flagged off and the Aurassure devices went online, set to monitor the city air quality round the clock. The devices were mounted on the smart poles accompanying other smart devices like CCTV, ANPR etc. Aurassure sensor network which has been deployed in Rajkot is composed of total 50 number of IoT based Environmental sensor devices. The devices are highly energy efficient with always-on compliance, supporting latest standards of connectivity for data transmission. The real-time measurement of air quality is done by the sensor network and the data is sent to our centralized server. The communication between the devices and the cloud to transmit data goes through the Ethernet and GPRS connection. All the data received by our servers is analyzed and processed to make the information meaningful. This information is then presented to stakeholders and citizens through a real-time pollution monitoring dashboard, the dashboard presents the data using interactive graphics and statistics for easy interpretation of data. Time and location-based trend analysis. The main requirement of the project was to check the environmental status of the air quality, sound levels measured and weather parameters to be visualized on a public website. This public website makes the data available for citizens and agencies for an effective policy management. Aurassure air quality management provides an open platform where city environmental standards can be monitored using smart analytic tools. The smart analysis of the data in real time will allow officials to predict when air quality will deteriorate and thus aid in taking crucial decisions such as warn kids, elderly and asthmatic citizens to avoid going outdoors to be safe. 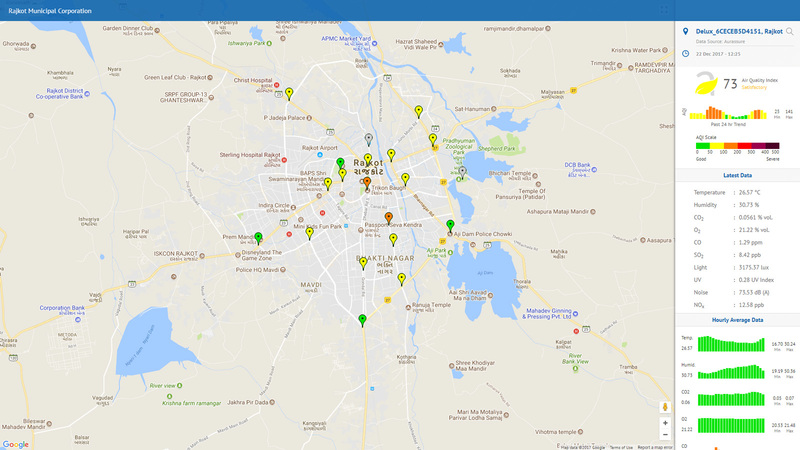 The city of Rajkot now benefits from Aurassure sensor data, allowing citizens and visitors to take precautionary steps and thus enjoy the healthy ambiance. The residents of the city can stay informed about environmental conditions through the Aurassure Dashboard, thus also reducing frequent site visits to test environment pollution and parameters. The RMC officials can now analyze the conditions at their fingertips in real time, which can reduce the delay in response time. Phoenix Robotix is an acclaimed start-up in the field of IoT and wireless sensor networks. We are one of the leading manufacturer and supplier of various environmental monitoring devices. 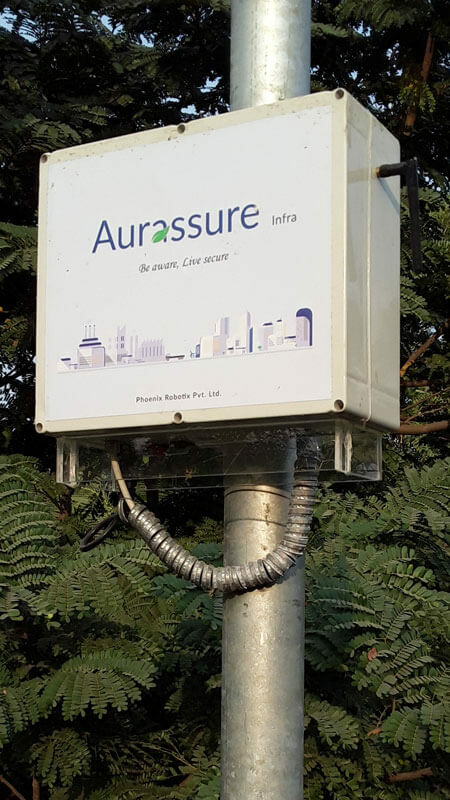 Our product Aurassure Infra has earned a very good reputation in the field of environment and air pollution monitoring. We had previously worked with many of our clients and provided them with our end-to-end solution for environmental awareness. We also have been acknowledged by our clients for using the best quality sensors in our devices. For more information about our products, contact us.